Russia's Progress 62 cargo ship arrives at the International Space Station on Dec. 23, 2015 delivering food, supplies and other equipment just in time for Christmas. 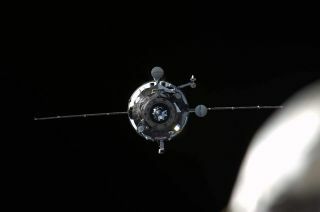 Russia's uncrewed Progress 62 freighter docked with an Earth-facing port on the orbiting lab today (Dec. 23) at 5:27 a.m. EST (1027 GMT), two days after blasting off atop a Soyuz rocket from Baikonur Cosmodrome in Kazakhstan. The Progress 59 mission experienced serious problems shortly after its launch on April 28, 2015, and never attempted to dock with the station. And SpaceX's seventh cargo run failed less than 3 minutes after launch on June 28, when the Falcon 9 broke apart, apparently because of a faulty steel strut in the rocket's upper stage. SpaceX has already developed a modified version of the Falcon 9, which launched Monday (Dec. 21) carrying 11 spacecraft for the satellite-communications company Orbcomm. That flight also featured the successful landing of the rocket's first stage back on Earth, marking a milestone in the development of reusable-rocket technology. SpaceX aims to launch its next cargo mission to the space station next month.